On May 20, the Seoul Metropolitan Government launched the Anti-MERS HQ and has taken diverse measures to prevent the spread of the infectious disease in the city. 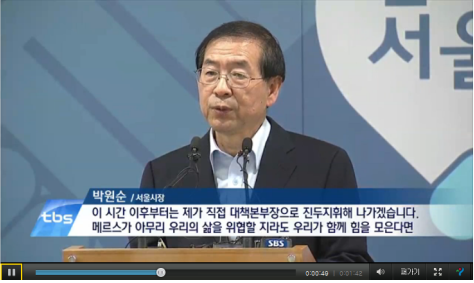 On June 4, Seoul Mayor Park Won Soon said that the Seoul Metropolitan Government would share MERS-related information with the people on a real-time basis at a briefing session in an effort to curb MERS in cooperation with the people. He added that the Seoul Metropolitan Government would take a stronger step to protect people’s safety and lives by mobilizing all available administrative capabilities. In cooperation with the central government, the Seoul Metropolitan Government intends to do everything it can to resolve the current crisis. On June 7, the Seoul Metropolitan Government increased the number of employees at the 120 Dasan Call Center by 119 people in preparation for a sharp increase in incoming calls for consulting, emergency requests, and the transportation of patients after the disclosure of the names of the hospitals associated with MERS. The Seoul Metropolitan Government is also considering operating a return call center in addition to the MERS-related Call Center. The 119 Situation Office has started working on an emergency basis. The Seoul Metropolitan Fire and Disaster Headquarters operates a team that handles the transportation of people exhibiting MERS symptoms, with each fire department operating a situation room. When it is judged that a person calling the Seoul Metropolitan Government requires more accurate, thorough testing, the team will send an ambulance for transportation to a hospital. To provide this service, a team composed of 20 to 30 public health center employees and 140 ambulances has been assembled. If required, the mobilization of 116 additional fire trucks will be considered. ◆ The Seoul Metropolitan Government Research Institute of Public Health and Environment (for MERS-related diagnosis) and 38 rooms at Seoul Metropolitan Government-operated municipal hospitals (for treatment in an isolated facility) have been prepared. 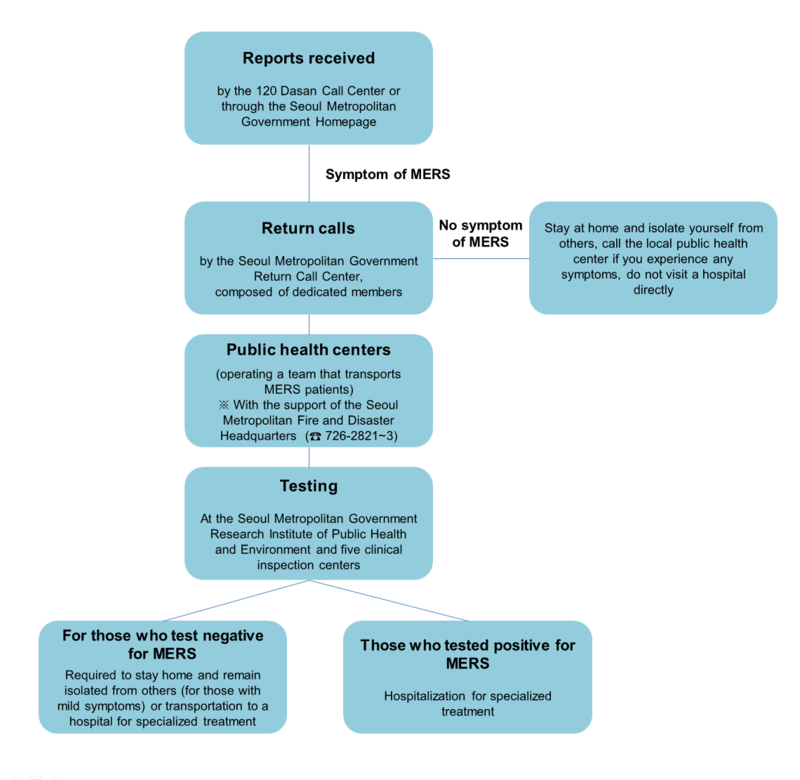 On June 7, the responsibility for MERS-related testing was transferred from the Korea Centers for Disease Control and Prevention to a local public health and environment research institute. The Seoul Metropolitan Government will send all of the necessary reagents and precautions for carrying out MERS testing to the institute. The Seoul Metropolitan Government Research Institute of Public Health and Environment (RIPHE) is responsible for making the final decisions on all cases in addition to carrying out both screening and confirmation tests. The Seoul Metropolitan Government has installed more personnel and facilities for testing at the said institute, thus doubling the testing capacity to 70 cases a day. The RIPHE has tested a total of 138 cases, with 128 cases testing positive, two cases testing negative, and the remaining eight cases are currently underway. As of 8 p.m. on June 7, the number of people monitored by the Seoul Metropolitan Government has now reached 1,552, including those who were home quarantined (1,337 people), those made to stay at relevant facilities (6 people), and those who have made simple contact with other patients (169). 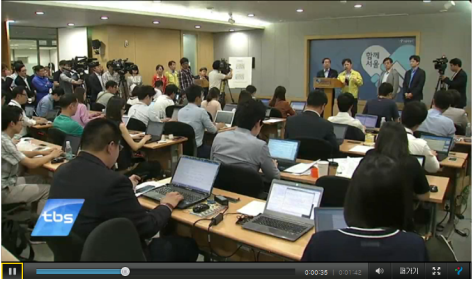 At considerable cost, the Seoul Metropolitan Government will provide anti-MERS supplies (e.g. hand sanitizer and cold weather masks) to public institutions and facilities, markets, large-sized supermarkets, department stores, cinemas, facilities for large-scale events, senior citizen centers, and daycare centers. The Seoul Metropolitan Government is taking steps toward disinfecting 307 subway stations, 13,130 buses, 70,000 taxis, and the five intra-city bus terminals. In particular, the low-hanging hand straps of subway cars and buses, public toilets, and safety handrails in public facilities will be treated with disinfectant at least once a day. All cultural events hosted or sponsored by the Seoul Metropolitan Government will be postponed until the current situation has calmed down. Concerning private events scheduled to be held in Seoul Metropolitan Government-operated facilities, the Seoul Metropolitan Government will accept their cancellation without penalty. The Seoul Metropolitan Government will also install a special treatment center near the main building of the Seoul Medical Center. The Seoul Metropolitan Government is planning to take all of these steps in cooperation with the central government, the 25 autonomous district offices in Seoul, and experts in the public sector. On June 6, Seoul Mayor Park Won Soon met with representatives of the Seoul Medical Association and asked for their cooperation in the epidemiological survey being carried out by the Seoul Metropolitan Government.